In last month’s eNewsletter, CHESS Director Joel Brock gave an overview of the CHESS-U project and how important the six summer science workshops were to help define the science frontiers an upgraded CHESS will serve. The project relocates five experimental stations and gives each of the new stations an independently tunable high-flux undulator source. 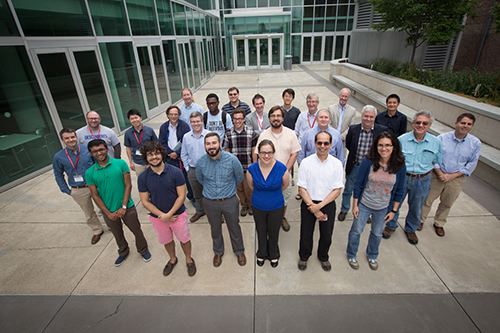 This workshop shared the goal of identifying pressing and important scientific needs for a future high-energy x-ray source utilizing unique capabilities of the Cornell accelerator and special types of organization and user support. The “D3” workshop was held on June 27th and 28th and involved 11 invited speakers and 32 attendees. 22 remote viewers asked questions and participated in discussions through an on-line YouTube stream. The organizing committee consisted of Jacob Ruff and Katie Silberstein (CHESS), helped by outside organizer Raymond Osborn (Argonne National Laboratory). This workshop addressed emerging opportunities in high energy single crystal diffraction using next-generation pixel array detectors, as a probe of lattice-coupled effects in quantum materials. This covers both diffuse scattering and weak-peak crystallography. This workshop brought together current and prospective CHESS users who can benefit from high dynamic range diffraction, to share results and identify strategic opportunities for future development in terms of detectors, software, beam properties, and high impact experiments. One major theme was emerging opportunities in high-energy, high-dynamic range diffraction using next-generation pixel array detectors as a probe of lattice-coupled effects in quantum materials. Raymond Osborn (Argonne National Laboratory) opened the workshop discussing how researchers can utilize both diffuse scattering and weak-peak crystallography that can be used to study phase transitions, low-dimensional correlations, short-range order, superstructures, charge-density-waves, phonons, frustration, quasicrystals, and strain. Several speakers built upon this theme to articulate a need to develop a quantitative, robust, intuitive understanding of disordered states of matter. Materials researchers are trained to think of solids as perfect repeating patterns, and defects as extrinsic “nuisances” which only act to obscure the underlying physics. This picture is fundamentally incorrect. All materials are disordered on some level, and correlated disorder is intrinsic to - and essential for - the properties of a wide-range of complex functional materials. Solving fundamental questions in disordered materials physics would have extensive technological ramifications. Understanding what appear to be exotic correlations, such as the topologically phases of strongly spin-orbit-coupled materials, could have far-reaching consequences for applications in fields of energy materials or the next-generation of quantum computers. Other areas of opportunity for x-rays include nanoengineering and studying superconductivity, where, for example, pinning defects and phase competition control the technologically relevant parameters such as critical currents, structurally robustness, to how high in temperature the supercurrents can be maintained. 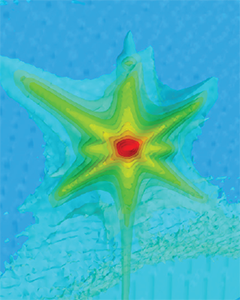 Only now are high dynamic range high-energy x-ray detectors making it practical to record comprehensive maps of the diffuse scattering that can begin to answer such subtle questions. After the meeting, CHESS scientists, organizers and participants joined forces to summarize notes and compose “white papers”, capturing the scientific need and opportunities for innovative work using an upgraded CHESS source. CHESS scientists are now working with members of the CHESS External Advisory Committee and members of the CHESS Users’ Executive Committee to refine, combine, reduce and/or sharpen the ideas captured from the workshops. The CHESS staff is enormously grateful to members of the user community and beyond who’ve helped shape the future of CHESS. Stay tuned to the CHESS eNewsletter to hear exciting updates on the CHESS-U upgrade. Some of the participants at Workshop 6 in the Physical Sciences Building.